I keep reading comments that Linux gaming is pretty much stagnating and not worth investing in because it is still at around 1% in the Steam Hardware Survey. So I decided to try and find some numbers. Unfortunately, there isn't all that much data publicly available, if you have additional or better data, I'll be happy to add them. Also, if you find any mistakes please let me know. How many Linux gamers are there, how much do they buy, what kind of growth do we see in Linux gamers and games? Steam has the most data available and also the largest number of games and gamers, so I'll look at this in most detail. The Steam survey gives a good starting point for how many Linux gamers there are. How reliable is the Steam survey? Valve hasn't published their methodology, so it's hard to tell. I often read Linux users claim the survey is less likely to appear on Linux, because it only ever shows up when they boot into their Windows partition. I've read similar complaints unrelated to Linux. I suspect that you are more likely to get the survey if you log in on a system that hasn't been connected to Steam in a while (or never). I haven't had a survey on my Ubuntu PC in some time, but a while ago I logged in from my Fedora laptop which I don't usually use for gaming and the survey popped up. Other users here have reported the same behaviour. This might also explain the initially larger Linux shares around March 2013 when many Linux users used Steam for the first time on their Linux boxes and were thus more likely to receive the survey. What we do know though is that the hardware survey doesn't show up in Big Picture Mode so SteamOS is currently excluded. It is hard to estimate how much of a dent that makes since there is no data on how many people run Steam Machines in BPM. 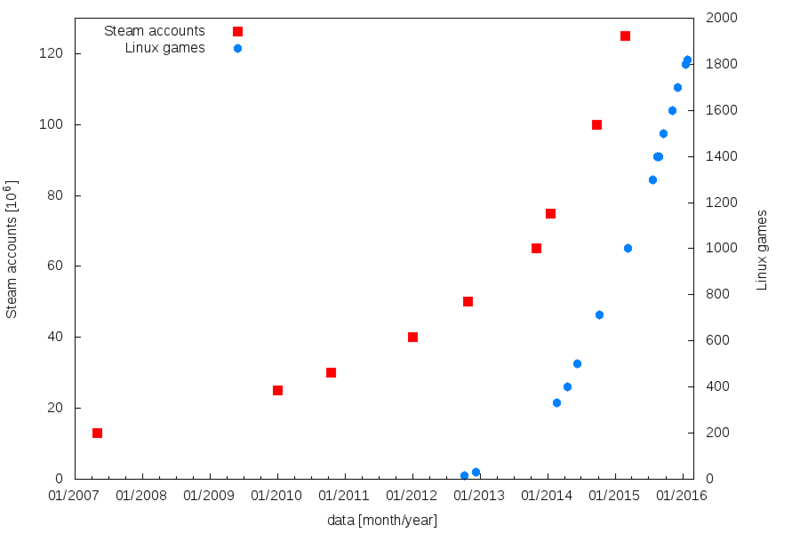 Assuming that the 1% Linux share is roughly correct, the total number of Linux gamers has grown quite significantly since 2012 simply because the total number of Steam users has grown significantly as shown in the figure below (Note: Some of the sites talk about registered accounts, but as far as I know Valve reports active accounts.). You can find the links I used at the end of the article. Additional older data can be found here. The first time Linux appeared in a survey was in January 2013. At the time, Steam had about 54 million users, meaning there were about 540,000 Linux gamers. The most recent number of Steam accounts I could find was for February 2015, at which point there were 125 million active accounts, thus 1.25 million Linux users. I did some fitting and extrapolation of the data, and come up with 160 - 190 million accounts as of March 2016. Take this with a huge grain of salt though, this kind of growth can't continue indefinitely. Whatever the real number, the number of Linux users on Steam has kept up with the overall growth, and should at this point be larger than 1.5 million unless Steam stopped growing at all. 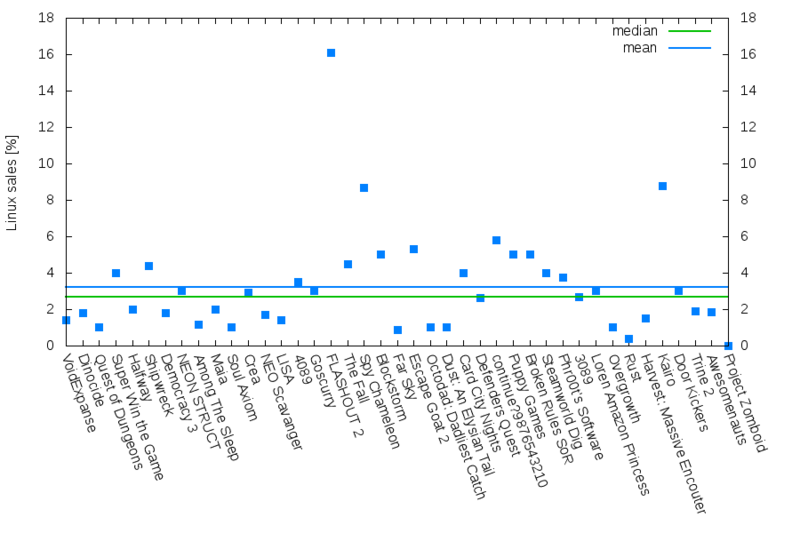 Also shown in the above graph is the number of Linux compatible games on Steam. This number is growing at a comparable rate to the number of users, even slightly faster. Overall it seems Linux on Steam is in a fairly decent state; no mas migration from Windows, but a steady growth in games and gamers. Unfortunately, GOG.com has, to my knowledge, never released any data on user or OS numbers. Looking at the GoL survey retailer statistics, about 90% of participants buy games on Steam. That means there are about 10% who only buy on GOG, Humble or other stores. Combining the above information, I would estimate the total number of Linux gamers at 1.6 - 2 million not counting SteamOS in BPM. Probably more important for developers is how many games Linux users buy. Cheese has a very nice collection of Humble Bundle sales data from May 2010 to February 2016. Looking at the combined results, Linux accounts for 4.7% of purchases and 6.9% of payments. Note that this data goes back to before Steam or GOG supported Linux, and Humble helped bring many games to Linux. 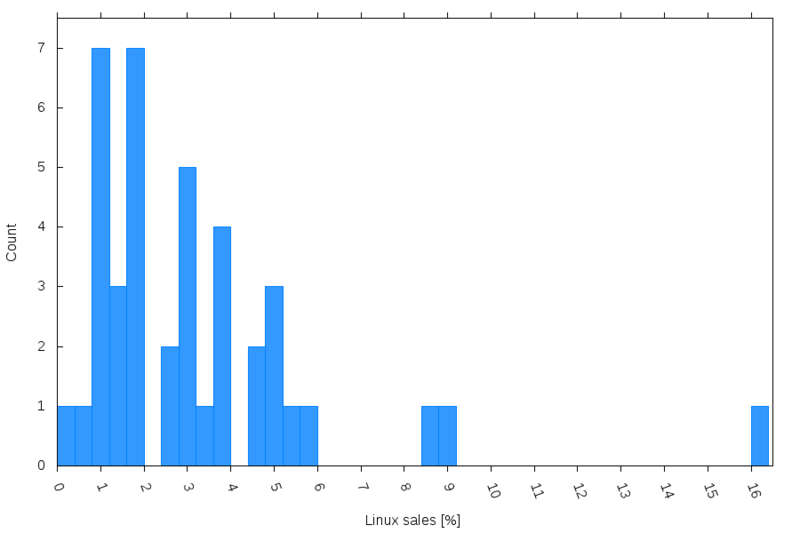 Based on these data, the average share of Linux sales is (3.2 +/- 0.4)%. The median is 2.7%. shows that the maximum is between 1 and 2%. One thing to keep in mind is that for many games the Windows version has a head-start, for example Dust: An Elysian Tail was 9 months late on Linux. Both the Humble data and the data from developers shows that on average, Linux users buy more games than the 1% that the Steam survey would suggest. This does not necessarily mean that the Steam survey is wrong though, it could simply be that since fewer games are available on Linux, Linux gamers are more likely to buy the games that are available. In addition, I suspect that Linux users are relatively more likely to buy from DRM-free stores than Windows gamers, meaning that the Linux share on GOG, Humble, and developers' websites would be higher - as shown by the Humble Bundle statistics and seems to be the case for Defenders Quest. All in all, looking at these numbers, Linux gaming has undergone an impressive growth over the last years, it's anything but stagnating. Quote This might also explain the initially larger Linux shares around March 2013 when many Linux users used Steam for the first time on their Linux boxes and were thus more likely to receive the survey. A very interesting point I don't think I ever thought about, and probably quite true too. That's a very interesting write up, thank you! as long as development stays strong with the adoption of Vulkan then Linux has nothing to worry about. but in order to see significant change though there will need to be some undeniable reasons for people to look into switching to Linux. Although I have seen some steady small numbers showing up in the "Eye Candy Linux" Community on Google+ that have said they just started using Linux and wanted help. I see this more often in the Ubuntu and Linux Mint community on Google+ there are people constantly looking into the other alternatives on the market. the linux community as a whole seems to be really helpful so far towards newbies. Plus I've noticed Dell is starting to show a couple of additional Linux laptops. We are literally at the very beginning of a possible breakthrough in technology and innovation because of more companies that are starting to take Linux a bit more seriously. e.g. Nvidia with their brand of self driving cars. I can't wait for the GDC coming up soon. This should be interesting. The Tux TF2 item landed at a time when acquiring timed-exclusive hats was something that people jumped on like mad. It had to have played at least a small role. Quote Both the Humble data and the data from developers shows that on average, Linux users buy more games than the 1% that the Steam survey would suggest. I still maintain that the Steam survey has significant shortcomings that make it hard to have much confidence in its results (nothing on the front has changed since this article). Two things that have definitely changed across that period has been the number of available titles and the number of active Steam users. Taking the numbers that Valve publish at face value, if Linux users have maintained that 1% representation, then there's a pretty good amount of growth (even if it's not proportional growth) implied. Quote Humble helped bring many games to Linux. I'd not spotted that post from Humble. At the time I wrote my last article looking at cross-platform support in Humble Bundles, there had been 59 Linux debuts in Humble's promotions between May 2010 and December 2012. Of those, the majority had been ported internally by the studios that created them (that includes stuff created using engines/tech that already had Linux support). Humble's stances since have sapped my motivation and I no longer feel like I'm the best person to chase the data, but unless they've released another 30 odd titles that I don't know about before October 2014, that post's assertion that Humble's in-house developed ports (ports done by employees or contractors of Humble) have hit triple digits is false, and the misrepresentation gives me further reason to be disappointed. The only way to entice gamers to linux would be if games were cheaper on that platform. Linux market share will always be hard to track just because the OS doesn't phone home and that's a good thing. norsetto The only way to entice gamers to linux would be if games were cheaper on that platform. Yeah, then every second Windows gamer would install Linux just to buy the game and maybe a few of them would play it on Linux while they're already logged in. But seriously, Valve could run an experimental "SteamOS-only sale", I'd like to see results of that. Cheeseness I'd not spotted that post from Humble. At the time I wrote my last article looking at cross-platform support in Humble Bundles, there had been 59 Linux debuts in Humble's promotions between May 2010 and December 2012. Of those, the majority had been ported internally by the studios that created them (that includes stuff created using engines/tech that already had Linux support). 194k copies from 123,75mil users is 0,156% - thats how likely mac and windows users buy this game.